Clarksville, TN – John Schnettler, director of the Austin Peay State University Marching Band, has a friendly, easy-going personality, but he might seem a little distracted during APSU’s final home game on Saturday, November 7th. That’s because his 150-member Governors’ Own Marching Band (GOMB) will add about 350 additional musicians for that day’s half-time performance. Hopefully, the resulting 500-member ensemble will mesh well after only a few hours of rehearsing. 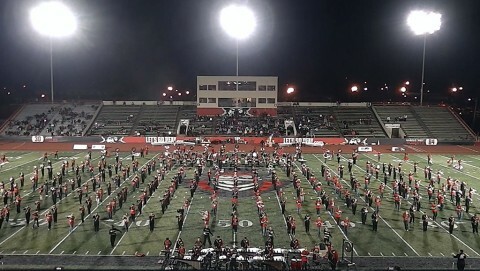 Austin Peay Governors’ Own Marching Band to feature 500 musicians at November 7th APSU Football game. The fourth annual event serves primarily as a recruiting day by allowing top musicians from across Tennessee to be part of the famed Governors’ Own Marching Band. Because of the GOMB’s professionalism, Schnettler said Saturday’s game will let music lovers experience a spectacular performance when more than 500 instruments come together harmoniously. The November 7th APSU Governors Football game against Southeast Missouri begins at 4:00pm.